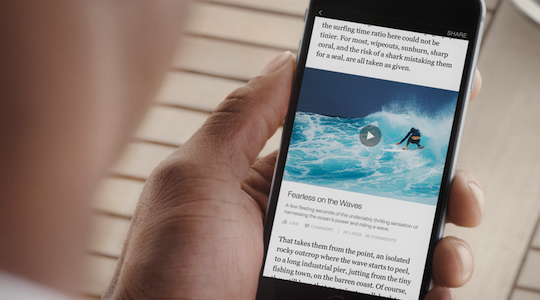 Facebook’s Instant Articles: great UX or the end of media as we know it? Facebook’s new Instant Articles has sparked controversy across the internet since its launch overseas yesterday. The new partnerships with publishers to post their multimedia content direct to the platform in return for a cut of ad revenue marks the “Culmination of Facebook’s quest to absorb the internet”, according to TechCrunch. A Facebook spokesperson told Marketing an Australian launch date is yet to be announced. Instant Articles aims to create a seamless experience for the Facebook user to read articles while browsing through their news feed. like and comment features within individual parts of an article. “As more people get their news on mobile devices, we want to make the experience faster and richer on Facebook,” Facebook product manager Michael Reckhow wrote on the company blog. Publishers will be able to place their own advertising into their Instant Articles and receive 100% of the revenue. If the inventory is unsold, Facebook will fill it and keep 30%. Facebook will also share data and traffic information through comScore and other analytics tools. The New York Times has been careful to point out to various media outlets that it is treating this partnership as merely an “experiment”. Commentator David Holmes warned on technology news website Pando that partnering with Facebook could increase risks for publishers with strong reputations, due to the social network’s heavy reliance on advertising, content controls through its algorithms and its questionable ethics. Peter Kafka similarly wrote on technology news and analysis website Re/Code that publishers should “Hope Facebook continues to use its enormous power to help, not hurt them. And that it doesn’t change the rules someday”. The Wall Street Journal has detailed the ad guidelines for placements in Instant Articles through publishers. But it points out that some publishers, such as BuzzFeed, will run their own custom ads inside the articles. two small banner ads either 320×50 or 300×50. Four ads per article will be the maximum, including a maximum of two small banners. No ads will be allowed ‘above the fold’, and autoplay on videos will be banned.